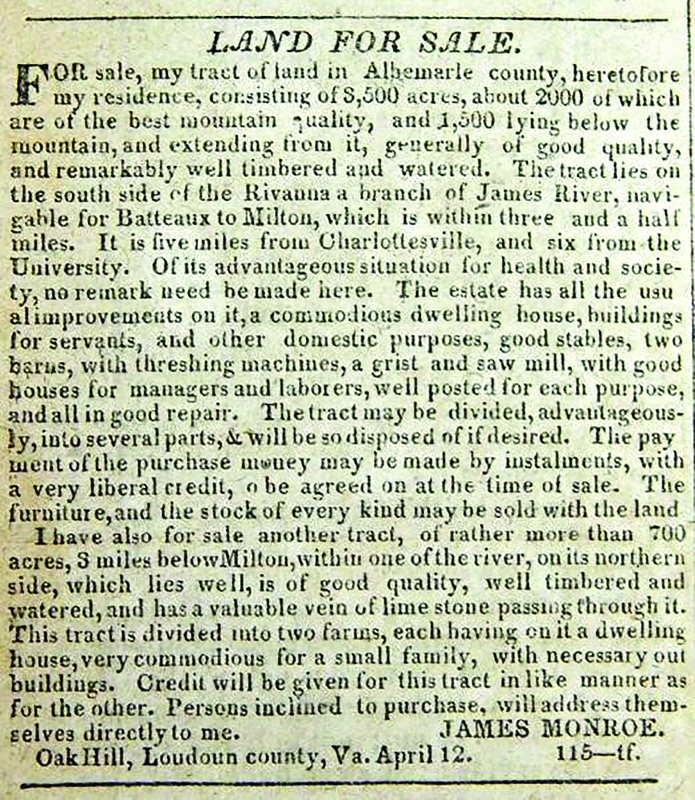 James Monroe’s story is only one aspect of Highland. 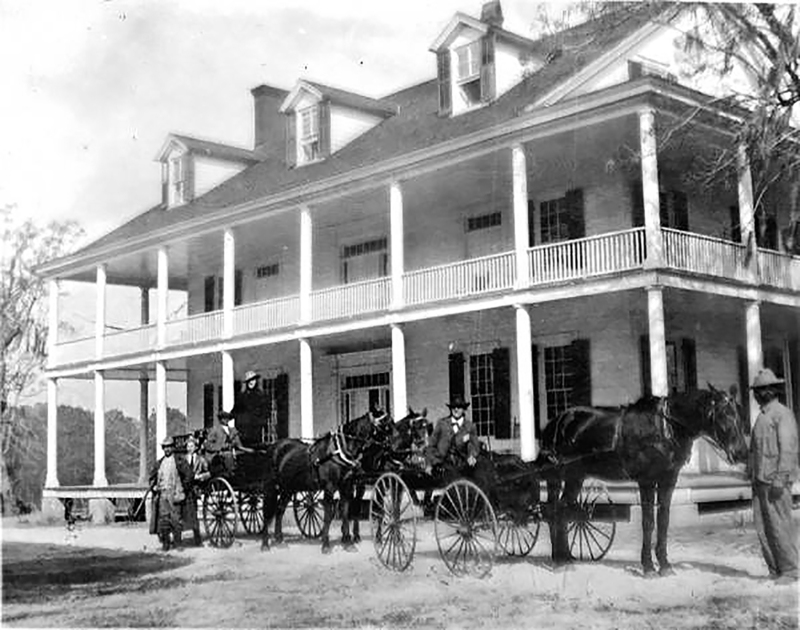 Enslaved women and men lived on the property for several generations, and had deeper connections to this place than did Monroe, who was often away in public office. Like other plantation owners and members of the founding generation, Monroe enslaved as many as 250 enslaved persons in his lifetime. He freed only one: Peter Marks, who was manumitted during the last days of Monroe’s life. We recognize the contradiction that Monroe enslaved dozens of individuals at a time, while also calling for the abolition of slavery. In an 1829 letter, he described slavery as “one of the evils still remaining, incident to our Colonial system” (Monroe to John Mason, 31 August 1829). Abolition, he thought, should be gradual, to avoid disruption of the social order and economy. He advocated and actively worked for the colonization and resettlement of newly freed blacks in Africa and the Caribbean. The contradiction between Monroe’s personal practice on the one hand, and his personal beliefs and political action on the other, cannot be denied. Yet his example is instructive, showing him to be a man of his time—aspiring to virtue and justice, yet never moving beyond the dominant views and practices of his historical context. More importantly, we recognize that the history of the United States is profoundly connected to the institution of slavery. It was enslaved labor that allowed the economic development of the new nation, most notably for Highland, in its agriculture. The legacies of slavery are present in our communities today, and understanding the nation’s fraught past is one way to address today’s issues. The perspectives of enslaved men and women are as crucial to understanding the United States as are those of U.S. Presidents. At Highland we strive to represent a multivocal history, one in which many voices combine to tell one set of stories. Slavery was embedded in the families of both James Monroe and his wife, Elizabeth Kortright Monroe. The president grew up on a tobacco farm worked by enslaved people. He inherited legal human property at age 16 (1774), when his father died and bequeathed to him an enslaved boy named Ralph, as well as unnamed enslaved farm hands. We do not know whether an enslaved woman was taken from her family in New York to accompany Elizabeth Monroe to her new life in Virginia on her marriage, as was common practice. Enslaved women and even very young girls were taken away from their homes by elite marriages—usually without the means to communicate in writing to stay connected to parents and siblings. 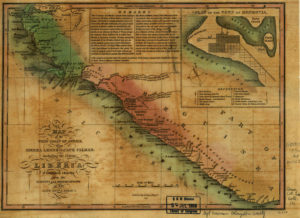 During his first term as governor, Monroe faced Virginia’s most alarming slave uprising. 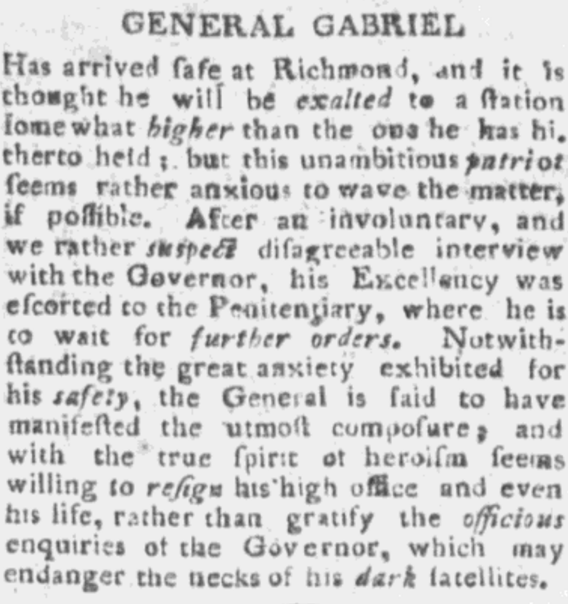 As this newspaper clipping explains, “Gabriel’s Rebellion” was named for a slave leader on Thomas Prosser’s plantation west of Richmond. Gabriel had been inciting slaves on nearby plantations to rise up against the white population. Monroe quickly mobilized the militia and thwarted the insurrection. 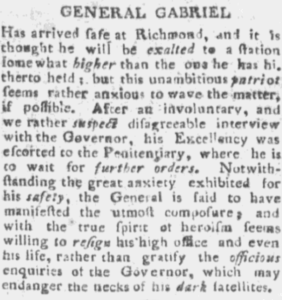 At the resulting trial—covered in local newspapers like the one shown—Monroe was torn on how to punish the conspirators, revealing to his friend Thomas Jefferson that he thought he should err on the side of mercy over severity in this case (Monroe to Jefferson, 15 September 1800). The event influenced Monroe’s views on how best to eliminate slavery by fueling his fear that immediate abolition could spur violence and race wars. 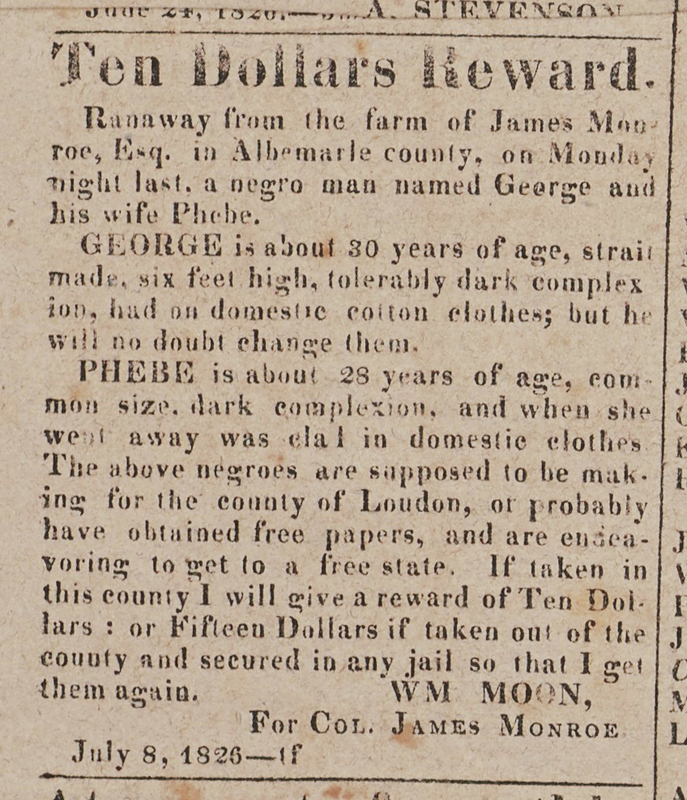 The Albemarle County, Virginia census showed 49 enslaved people living at Highland in 1810, making Monroe one of county’s largest slave owners at that time. 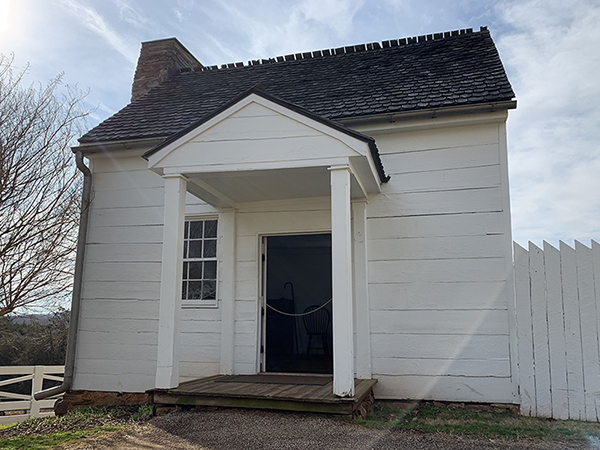 Of the 1,500+ households in the county that year, 14 had larger slave inventories—including Thomas Jefferson, who held the most, with 147. Highland’s enslaved population included field workers and skilled workers (blacksmiths, carpenters, masons and “house servants”—including valets and maids, and a cook and her assistants). While Monroe was often away pursuing law and politics, the enslaved workers maintained Highland’s day-to-day operations and became intimately familiar with the surrounding countryside. Monroe supported colonization as a means of gradually reducing, and ultimately abolishing, slavery in the United States. He exchanged ideas on the topic with Thomas Jefferson from the early 1800s. 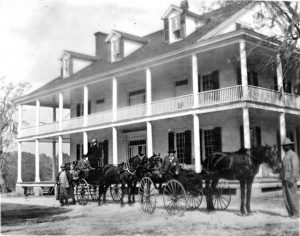 In 1817, Monroe’s first year as president, the American Colonization Society (ACS) formed for the repatriation of freed slaves to Africa. Five years later, Liberia was established as a place where freed U.S. slaves, as well as Africans captured on foreign slave ships, could be resettled. 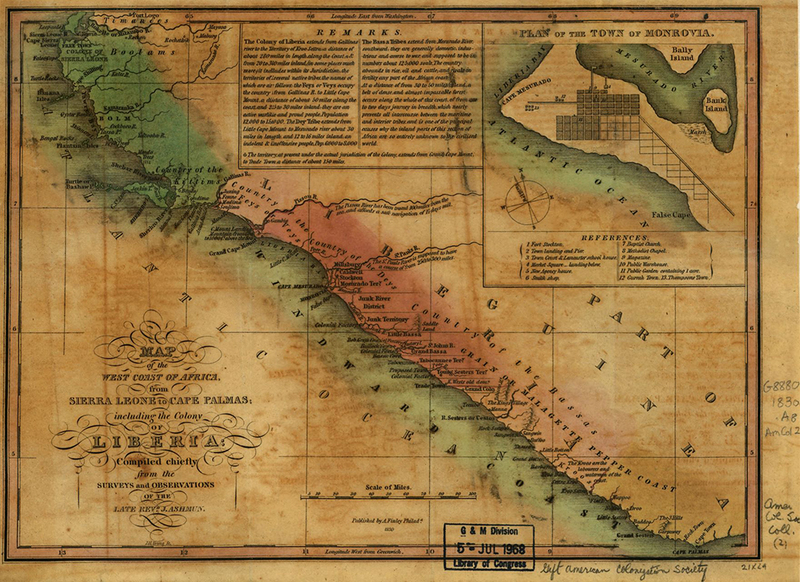 The country named its capital, Monrovia, after Monroe because of his endorsement of the ACS. As the South’s economic engine shifted to cotton by the 1820s, Highland’s profitability—which came from grain—plummeted, with dire consequences for enslaved field hands. Since cotton does not grow in the Virginia Piedmont, Monroe and neighboring farmers were left behind. Facing potential financial ruin, he listed Highland and his Loudoun County property, Oak Hill, for sale in the Richmond Enquirer. He first sold the house at Highland, and later its farmland, said to be of “the best mountain quality,” in close proximity to Charlottesville and the University of Virginia, which had just opened (in 1825). The latter sale dispersed a number of enslaved African Americans. Life wasn’t easy for Highland’s enslaved population. 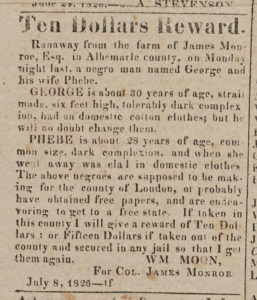 Two slaves named George and Phebe were among those who risked their lives to escape their conditions. 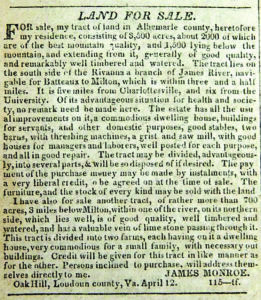 After the pair ran away from Highland in July 1826, Monroe placed an advertisement in the local newspaper (shown here), offering a reward for their return. We do not know whether they achieved freedom. Among the difficulties Highland slaves endured was the instability caused by frequent transfers between Monroe’s two properties according to work needs. When Monroe was selling the farmland at Highland in 1828, many of Monroe’s enslaved men, women, and children were dispersed southward. Those sold went to a cotton plantation called Casa Bianca in Jefferson County, Florida. The buyer, Colonel Joseph White, may or may not have heeded Monroe’s stipulation that enslaved families be kept together. 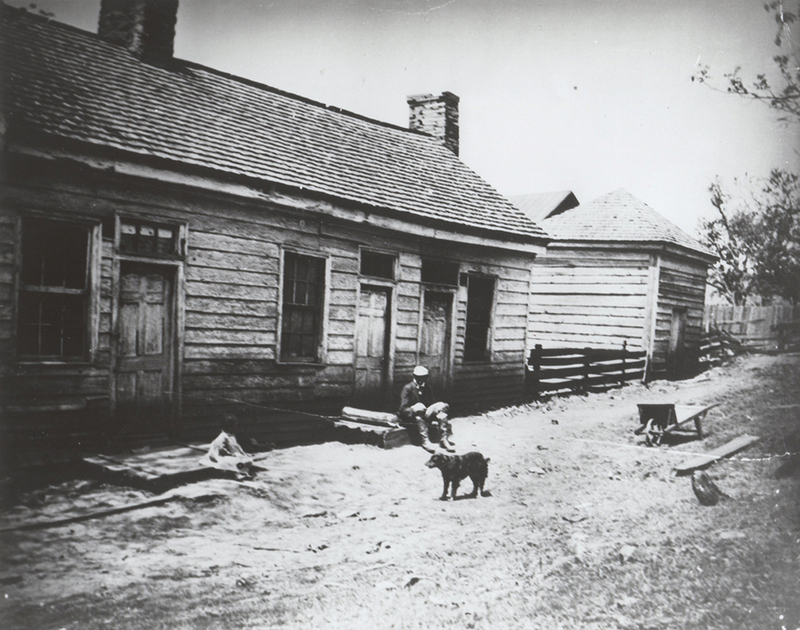 Highland’s slave quarters remained intact until the 1920s. A reproduction was rebuilt in the 1980s based on a 1908 photograph (shown here). Today, visitors can walk through the recreated quarters and see demonstrations of chores that were part of slaves’ daily lives at Highland. Research continues to shed new light on this population—their names, relationships, backgrounds, and contributions to building the presidential property.